Bishop McCort offers one of the best college preparatory programs of study in the area in a unique academic environment. Enriched by Catholic intellectual and cultural traditions, it is a place that throughout its history has promoted excellent teaching. At Bishop McCort, you can join a community of students and teachers committed to advancing its rich Catholic mission of “Learning to think rigorously, so as to act rightly and to serve humanity better.” (Pope John Paul II). At Bishop McCort, you will find a diverse community of students and teachers who are committed to that mission. 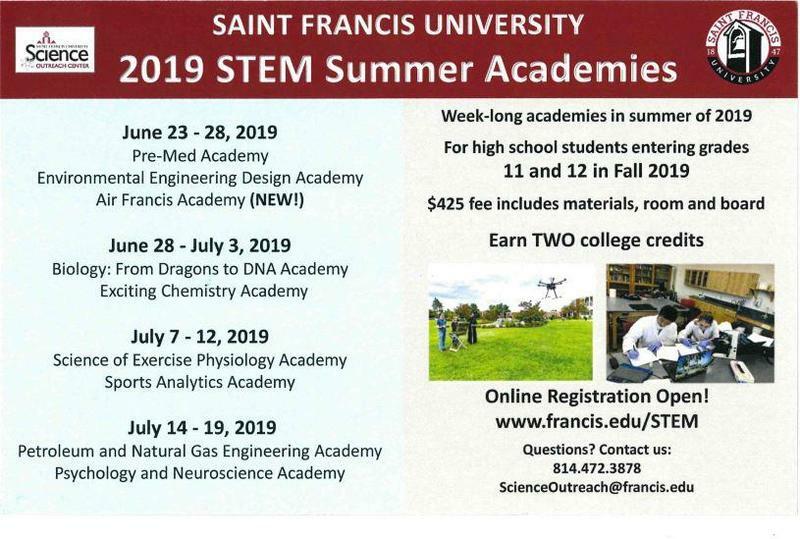 Saint Francis University 2019 STEM Summer Academics are one week programs in engineering, aviation, computer science, health science, biology, and chemistry designed to provide unique experiences for talented high school students entering their junior of senior years.